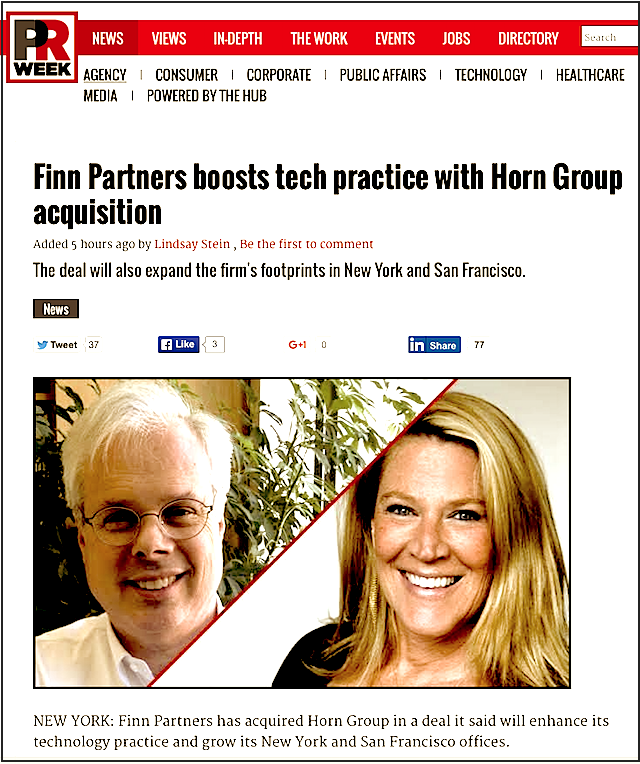 PRWeek’s Lindsay Stein reports that Finn Partners has acquired Horn Group for an undisclosed sum to boost its tech practice. After more than two decades in the business, Horn said she started thinking about selling, and Finn Partners was attractive because of its fresh thinking, independent stature, and culture. She noted that the deal will also expand its reach both in terms of geography and services. Horn’s security software clients may be interested in Finn Partners’ lobbying practice in Washington, DC, for example. In 2014, Finn had 370 staffers worldwide and more than $52 million in global billings. Following the Horn acquisition, the agency will have about $70 million in annual fees and 500 employees. Foremski’s Take: Sabrina Horn is one of San Francisco’s top PR industry mavens, (even though she has been spending most of her time in New York these past few years). I’ve worked with Horn Group’s San Francisco teams on many stories over the past 15 years. And it is where I met BrightIdea, one of my favorite San Francisco startups, which started life in the basement of Horn Group’s office. BrightIdea CEO Matt Greeley and his Head of Culture Michelle would organize fabulous monthly Friday Salons which became unmissable and where I made many good friends. There’s still a few independent PR firms left in San Francisco and the majority are run by women (exceptions include Todd Defren’s Shift Communications - (Todd recently shifted to San Francisco from Boston). These women entrepreneurs have been very successful in the PR industry building sizable businesses of usually around 100 to 150 staff. Some have been acquired such as Outcast Communications by publicly traded Next15. But the world is dominated by much larger PR firms such as Edelman, privately held; and giant publicly traded conglomerates such as WPP, Omnicom and Publicis that each own dozens of big PR firms such as Weber Shandwick, etc. 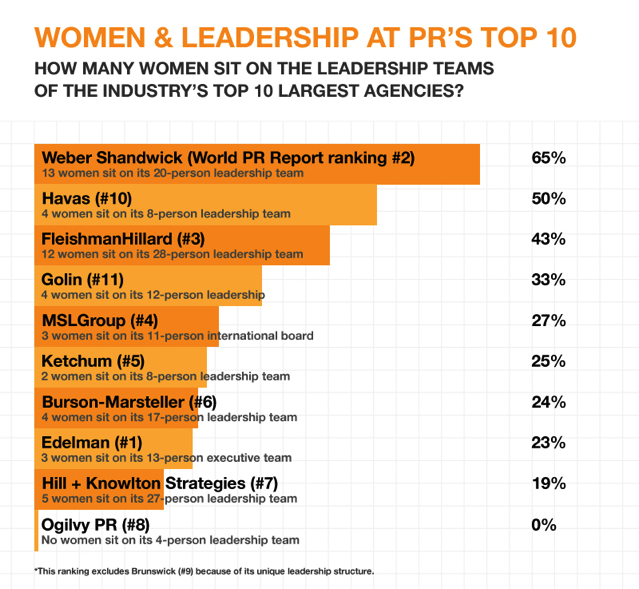 And there’s very few women executives at senior levels in these larger PR organizations. There clearly is a barrier here that prevents successful women business leaders — such as San Francisco and Silicon Valley’s many women PR firm founders — to move up into large PR organizations despite their evident success in running their own business groups for many years through good times and bad. Why aren’t those formidable business skills being recognized within the senior executive ranks of the PR industry’s largest firms? Updated: Aarti Shah at Holmes Report published a great report into this barrier to female PR execs earlier this year: Why Aren't There More Female CEOs In PR? Among the 250 firms on the list — which spans agencies as big as $750m in fee income to those as small as $3m — 75 have at least one woman in its top post. This number, however, dwindles further when looking only at firms with revenue of more than $100m.